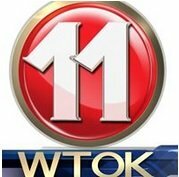 News TV Channel / WTOK-TV is an ABC-affiliated television station for Meridian, Mississippi. It broadcasts a high definition digital signal on VHF channel 11 from a transmitter south of Meridian on Crestview Circle (along MS 145/Roebuck Drive) in unincorporated Lauderdale County. The station can also be seen on Comcast channel 6 and in high definition on digital channel 431. Owned by Gray Television, WTOK has studios at 815 23rd Avenue in Meridian's Mid-Town section.